There’s a certain cinematic brilliance to a water feature that perfectly suits its environment. Water features and ponds can add value to a property that far exceeds the cost of installation, but that’s only because there’s something innately valuable in the feature itself that can’t quite be quantified. The creation of a new habitat; the serenity of water that reacts in a perfectly appropriate fashion to any disturbance on the surface; the sound of rain. The aesthetic pleasure that properly installed fountains and ponds can bring is within the grasp of anyone who works with a provider who brings the experience and craftsmanship required. Beyond the wealth of value that water features and ponds can add to your property, it’s also important to consider the lifestyle benefits these elements can bring. 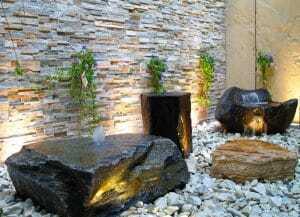 Whether for a home, public, or business setting, these wonderful landscaping tools can make an excellent backdrop for entertainment purposes, and can provide a retreat from the noise of traffic or neighbours. Many happy owners also report a level of relaxation, accompanied by a reduction in stress levels, that offers intangible value to their lives. Overall, a water feature or pond can turn what might ordinarily function as an outdoor space into an outdoor living space. That’s why we here at Everlast Services provide a wonderful array of garden fountain design and installation services. Everlast Services is proudly Australian owned. Our showroom and state-of-the-art manufacturing factory is located in Hoppers Crossing, Melbourne. In choosing Everlast Services, you’re not only assuring yourself of quality workmanship and wares, but you’re also supporting local Australian business and manufacturing. Our mission at Everlast is to offer an industry-leading standard of service and products at an affordable price. How can we do this in such a competitive market? The answer is simple. Our 20 years’ worth of experience and expertise means that we know landscaping inside and out, top to bottom, back to front. Our ability to manufacture our own goods, combined with our knowledge and efficiency means that our unique attributes are your gain. For all of your landscaping, water feature, and pond requirements: Everlast does it all. We’re affordable, reliable, Australian owned and friendly to boot.